September 29, 2014 -- The decommissioning and demolition of the Glenwood Landing power plant will not come close to having the devastating impact on residential property owners' school tax bills this year that some had once feared. 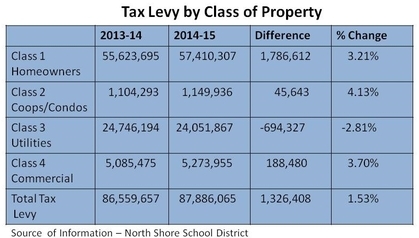 Last week, the Nassau County Assessors office provided final numbers to the North Shore School District on the amount of the school tax levy for which each of the four property classes would be responsible in 2014-15. The proportion of the total tax levy that homeowners (class 1) pay increased from 64.26% to 65.32% and the proportion that utilities (class 3) pay decreased from 28.59% to 27.37%, while coops and condos (class 2) increased from 1.28% to 1.31% and commercial properties (class 4) from 5.87% to 6%. Despite the 30% decrease in assessed valuation, the overall tax rate for utilities, including LIPA and American Water, will skyrocket this year as a result of the tax burden shifting to other properties within that class rather than to other classes. School district officials only a year ago had warned that the decommissioning could result in a single year tax hike as high as 19% - even with no increase in the overall tax levy. And while the average homeowner will see a 3.21% increase in their tax bill, even though the overall levy is rising by only 1.53%, the increase is a far cry from the worst case scenario, and lower than last year's tax levy increase of 3.49%. Utilities' overall burden will decrease by 2.81% while commercial properties will see a 3.7% increase, and Coops and Condos a 4.13% increase this year. Under New York State Real Property tax law, the shift in apportionment from one tax class to another is limited to 5%. However, for the last several years, that number has been reduced to 1% by legislation (1803a) that has been renewed annually, as it was this past June for 2014-15. If the legislation is not renewed for 2015-16, the maximum shift will return to 5%. Assistant Superintendent Olivia Buatsi said taxpayers are protected "for now", but that was no guarantee that the legislation would be renewed or that the county assessor would apply it in future years as the plant is further demolished. July 1, 2013 -- At this evening's board of education meeting, North Shore Schools Superintendent, Ed Melnick warned the audience that North Shore residents may see their school taxes increase as much as 19% in the 2014-15 School Year. The increase is result of a new proposal worked out by the state legislature and Governor and a reassessment of LIPA's Glenwood property. Under the state government's proposal, LIPA would see its assessments on its power plants decline by about sixty percent over a ten year period beginning in the fall of 2014. In addition, LIPA will discontinue its efforts to recoup what it claims are tens of millions of dollars in tax overpayments to school districts and local governments over the past several years. The communities affected are North Shore, Island Park, Northport and Port Jefferson. School districts and other local governing bodies in which the plants are located will have 4 months from when the proposal is finalized to accept the offer. Districts that reject the proposal can try their luck in court where LIPA has to date been unsuccessful in its tax certiorari lawsuits. Melnick explained that North Shore will be hit particularly hard because of a recent reassessment of the value of LIPA's Glenwood property which was reduced from $210 million to $105 million. LIPAs tax obligation to the district would be reduced from $22 million to $9.6 million. $7 million would be shifted to residential taxpayers. Even if the school tax levy of more than $80 million remained constant from this upcoming school year to the next, a home assessed at $750,000 would see more than a $2000 increase in its school taxes.